Posts tagged " WSJ crossword puzzle "
I have a somewhat competitive nature. At those words, I hear my children guffawing and saying, “somewhat!! !.” Despite their convictions, I sometimes did manipulate the cards to let them win Candyland. However, I do prefer winning to losing even when I’m only competing against myself. 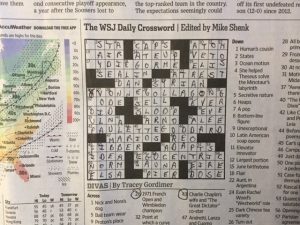 Most mornings, during breakfast, I do the Wall Street Journal crossword puzzle. I derive satisfaction from seeing all the boxes filled in. This morning, I left the spaces for the first clue down blank. The clue reads “human’s cousin” – three letters. I know they want me to write a-p-e, and that would complete three other clues in the across section. I won’t do it. It may not be the equivalent of storming the Bastille or standing against the tanks in Tiananmen Square, and it may even be silly, but it is a fist in the air to myself.